John's first new material in four years since the release of "And" (The Church With One Bell, 1998, is an album of cover songs and an excellent one at that). 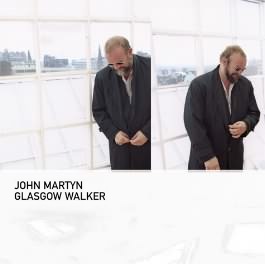 Glasgow Walker marks a departure for John in that it is the first album he has written on a keyboard instead of his trusty guitar. "Phil Collins suggested I should buy this certain type of keyboard (Korg Trinity) which he uses and that's why it's taken me three years to make the album. I had to spend eighteen months learning how to get a reasonable sound out of it. I still can't really play it. "The album was remixed with additions from the Glasgow Gangster Funk Boys and later on Kathryn Williams added vocals, which work very well on Can't Live Without. John's favourite song on the album is Wildflower,"That's real heart on the sleeve stuff. You can't mistake the emotion in that one." John prefers writing love songs and says "They come easily to me. I don't know why, it's not as if I am an abnormally loving person. I'm an incurable romantic and that can be uncomfortable in these troubled an cynical times. But I am proud of it and I am not going to change now." One of the standout songs on the album is So Sweet. The song is about a friend of John's who packed in her relationship with her boyfriend, and said how sweet it was to be free. John asked her if she found it painful, and she replied "Yeah, but sweet." The working title for this song was 'African' not surprising given the strong African influence in the song. The funky Mama T is a song dedicated to his girlfriend, Theresa, or Mama T Razor, as she becomes known in the song. Perhaps John's best vocal performance on the album comes last with You Don't Know What Love Is. "Mostly I give my singing seven and a half out of ten," John says modestly. "But about once every three years of so you hit nine and a half. And when it happens you never really know why it happens." This song was recorded by John at the request of Anthony Minghella for his film The Talented Mr Ripley and also appeared on the soundtrack album to the film. The Cat Won't Work Tonight is not a love song. "The guy that was producing the record was wondering why the f*** didn't I get on and do some work. So I started thinking about the word work and who works and who doesn't. It's so obscure nobody will understand it at all. I like the milk bottle solo," laughs John. "It knocks all the other milk bottle solos into a cocked hat, really. It's world class milk bottling." One song that did not make it on to the album was Sergeant Sergeant. This is a song, which features lyrics about many of John's friends. John has performed the song live on one or two occasions and it proved popular with fans .